Willey Gale, a 13-year-old Coralville boy with autism, sat close to his mother, Casey, one March evening counting the days to spring break on her fingers. “Saturday, one. Sunday, two,” he said, clutching a finger for each number. What did Willey plan to do during these days? “Play video games!” he answered loudly. Moments later, he wriggled from Casey’s arms and darted up carpeted stairs. He ran past a ketchup stain, the mark of another of Willey’s endearing quirks – he loves ketchup – and into his room. That’s his haven; it’s where he acted out scenes from two shows he was watching at once – one from his television, another from his laptop. Willey has his own way of doing things, and in all likelihood, he will never talk to his family in a typical way. 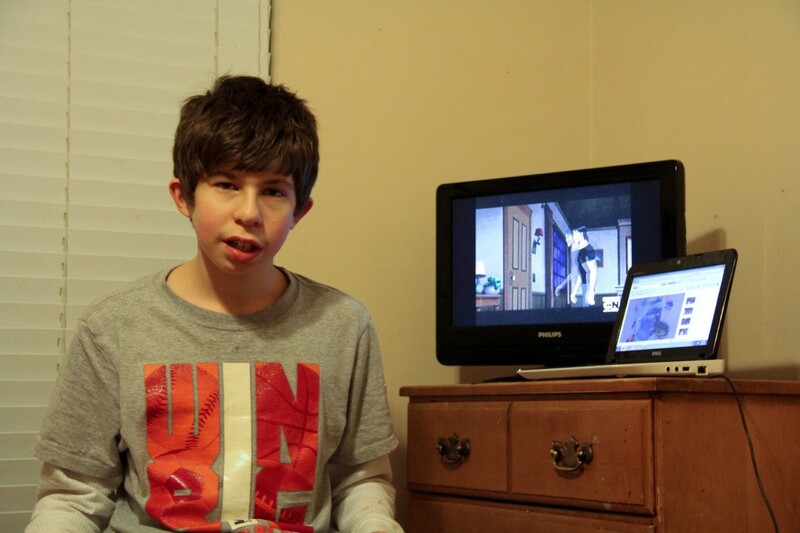 But with speech treatment, he has made progress, and Casey loves his unique language of short sentences. “We can have conversations with him now, and that’s important,” she said. Treatment and related expenses for an autistic child like Willey are expensive – some of the most effective cost $50,000 annually – and many parents cannot afford them. Recently, Iowa legislators tackled a bill that, if passed, would have given families access to up to $36,000 in annual coverage for each child who is under 21 and has autism or a related disorder. The bill could still become part of a broader piece of legislation called a “standings bill,” which is often addressed at the end of a session. But supporters say they will continue their effort next year if necessary. Under Iowa law, families of children with autism have limited access to coverage for treatments to help with speech, but not for treatments that help behavior. In January, a law that passed last year began covering only families of state employees. A state business and industry group fought broader coverage, which would affect all children in the state, because they say it could raise premiums. Iowa legislators trying to help autistic children are not alone. Similar legislative efforts are sweeping the country. Twenty-five states have passed laws that apply either to state employees or to all children, and all but one was passed just since 2007, according to Autism Speaks, a Washington, D.C., advocacy group that seeks funding for research. Another ten states are considering such legislation. In Iowa, no one has made an accurate count of autistic children, said Sue Baker, an autism service consultant for the Regional Autism Services Program’s Child Health Specialty Clinic at The University of Iowa. But the Iowa Autism Council is working on a survey to provide that number, and it is expected to be complete by July. Many experts agree treating autism early is vital and could eventually save taxpayers money, because early treatment helps children develop skills faster and more completely. People with the disorder often have trouble sharing needs, thoughts and feelings. And they may not understand how to seek help or have typical relationships with others, including family members. Some cannot speak. Iowa State Sen. Daryl Beall, D-Fort Dodge, who introduced a full-coverage autism bill last year that got cut back to cover only state employees, has a grandson, Drew, who has autism. While his twin brother, Jace, developed normally, Drew began withdrawing, having trouble making eye contact, and he became pre-occupied with motion. Drew also became more focused on how his toys worked, rather than playing with them. Drew’s father, a special education teacher, realized quickly that Drew had autism. 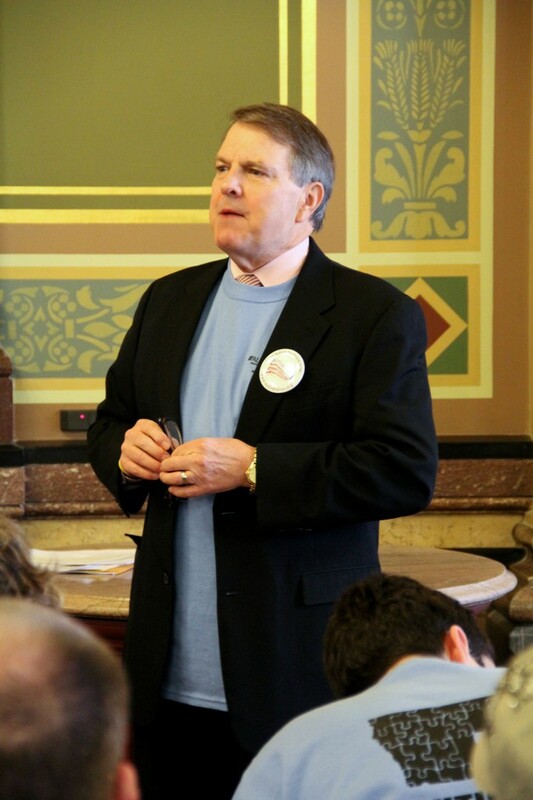 Sen. Daryl Beall, D-Fort Dodge, addresses autism advocates at the Iowa Capitol in March. He introduced a bill this year that would help families cover costs of autism patients. Last year he introduced an autism bill that was cut to cover only state employees. Photo by Holly Hines. There is a creek in his family’s backyard, and they often worry about Drew’s safety if he wandered off. Beall said Drew is a bright little boy. When he was roughly 17 months old, he could count to 20 forward and backward. He could also recognize a six as an upside-down nine. Because Drew’s parents are not state employees, he doesn’t benefit from the law his grandfather introduced. Beall thinks one-on-one treatment methods are important and effective, but they are also among the most expensive. A person with autism can cost roughly $3.2 million in autism-related expenses throughout a lifetime, according to a 2007 study by Michael Ganz, an adjunct assistant professor at Harvard University. These costs include medical bills, income lost by parents helping their children at home instead of working, and other factors. Ganz said treating autism early would offset some of these costs, because families could avoid expenses for more severe symptoms in the future. To treat early, many therapists use applied behavioral analysis, a method insurance would likely cover if legislators pass the bill. The method helps therapists tackle behavior problems, such as self-injury and tantrums. Kopelman said some children run off suddenly without supervision and may not know how to ask for help. But behavior treatment can help children learn to be safe in these situations. Therapists focus in part on helping autistic children learn how to communicate. And they often work with children one-on-one to focus on behavior troubles unique to each child. “It can be very hard for them to understand what people are asking of them,” Kopleman said. Among treatments, most experts believe applied behavioral analysis works best. Therapists provide it in clinics or at home sessions. But it can cost up to $50,000 annually, and it is not a “cure all,” Kopelman said. Changing insurance requirements could increase access to treatments before autistic children start school, where many qualify for special education. More families could also afford treatment types many agree should be used in a medical setting, outside of school — like the one-on-one behavior method. Tackling autism early should be a priority, said Josh Cobbs, chair of the Iowa Autism Council, which operates out of Des Moines. He said getting good treatments early can reduce societal costs related to the disorder. And some of these costs include state tax dollars. Currently, families can apply to pay for treatment through a Medicaid program, paid for with state funding. The initiative is called the Home and Community Based Waiver Programs. But Cobbs said some families aren’t eligible for these waivers, because they don’t meet the criteria. For example, to qualify for an “intellectual disability” waiver, their child’s IQ can’t climb too high, he said. The program provides no specific waiver for autism. And each type of waiver has separate criteria. Cobbs also has a son with autism, and he said his son’s case is somewhat severe. Therapists have helped him with speech and behavior treatment at his home. They gave him toilet training and taught him to eat better. He said his son, who is 10, has a good sense of humor. “He likes Spongebob and Youtube and Ebay,” Cobbs said. Some are wary about adding the insurance coverage because of costs. The Iowa Association of Business and Industry, which reviews policies and laws affecting business, is against autism coverage, said John Gilliland, senior vice president of the Des Moines organization. As a rule, the group opposes any legislation mandating coverage for a specific illness. Gilliland said legislators introduce many bills each year for individual health concerns, including bulimia and hearing aids, as well as autism, and the costs would quickly add up. In 2009, 13 bills for various types of required health insurance coverage were introduced, he said. The autism legislation wouldn’t be effective in all cases. It would not apply to businesses with more than 100 employees that are self-insured. It would likely have the most impact on small businesses with under 100 employees, who use small-employer plans, Gilliland said. “They don’t have a lot of leverage when they’re trying to buy health insurance,” he added. Requiring autism coverage would likely increase insurance premiums by one dollar per person, per month, and the money would go into a pool for autism claims. But this funding likely wouldn’t cover all costs, said David Van Ahn, owner of Heartland Investments and Insurance in Clive, Iowa. He said insurance companies would need to raise prices to cover the additional costs. Van Ahn has a 44-year-old daughter, who is quadriplegic. He remembers feeding her with an eye dropper when she was a baby, because she couldn’t swallow. “I am torn between the issues,” he said. Van Ahn said he understands that families of children with disabilities need help. He supports state funded programs that help families afford treatment, such as Medicaid. He also supports looking into other options that would use state funding. 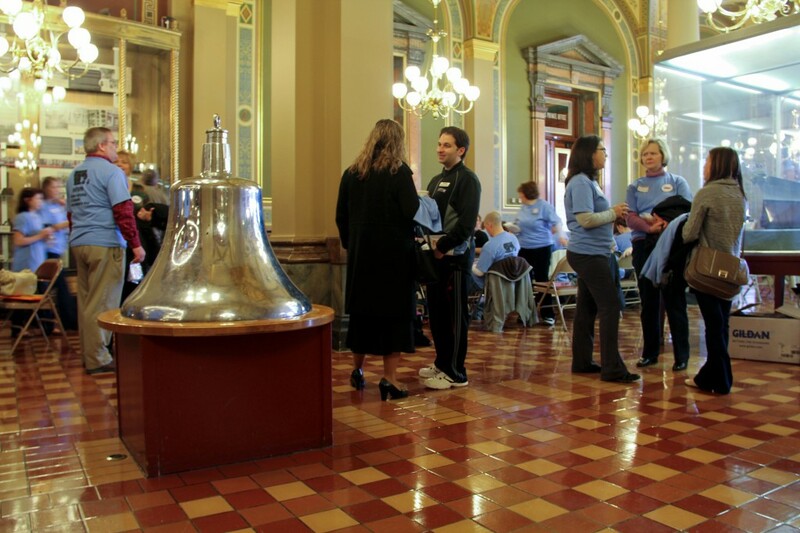 In March, more than 100 autism advocates in Iowa staged a rally at the capitol in Des Moines, in part to support the pending insurance law. Stuart Schunan of Altoona, a 23-year-old with autism, was among them. Autism advocates assemble at a March 2011 rally at the Capitol. Photo by Holly Hines. Treatments are important, he said; they help him keep track of things, like his medications. Stuart gets treatment through a program called The Homestead in Altoona, Iowa. It helps provide housing for him and his roommate, another autistic adult. He said he gets along with his roommate — sometimes. The Homestead also offers some services for autistic children. Erin Enyart, an Ankeny parent of two children with autism, believes treatments have been extremely effective. “It’s night and day,” she said. Before treatment, which Medicaid paid for, her daughter rarely looked her in the eye and often lingered “off by herself.” Afterwards her daughter began approaching her to play. She also started spending more time with her brother, Enyart said. Willey Gale’s sister, Bailey, said she believes she has a normal relationship with Willey — but she’s not quite sure what “normal” means. At the mall, she holds his hand to make sure he doesn’t wander. And she knows he might get mad if she tells him to be quiet during a movie. “He was really excited to see me, which made me really excited to perform,” she said. Monica Ryan-Rausch, who works at an after-school program in Cedar Rapids with children with Asperger’s, a form of autism, said many parents pay for autism treatments on their own. Ryan-Rausch works with middle school and high school students at Four Oaks. She said treatment outside special education at school is important, in part to help with social behaviors. She said autistic children — including those with higher IQs — may have trouble talking to people and making friends. At Four Oaks, Ryan-Rausch helps these children learn the “hidden rules” of social behavior that people with autism may miss. In one activity, she explains the steps of a typical conversation and why each step is important. She also demonstrates acceptable ways to enter or end a conversation. She role-plays the “dos” and “don’ts,” having children point what out what went wrong. Autism can cause a lot of stress, said Casey Gale, Willey’s mom. But she said appreciating Willey’s personality makes the situation easier. She said Willey prefers to be alone, and he often drools too much. He ignores rules, or doesn’t understand them — sometimes, she can’t tell which. Casey hopes Willey can someday contribute to society. But she also embraces the skills and qualities he already has. “We love his drooling; we love his yelling; we love his jumping,” she said.